Less than 400 miles from the finish line now, Cheminées Poujoulat has passed Cabo de Gata, east of Almeria, and is starting the final ascent of the Mediterannean out of the Alboran Sea to Barcelona. Crew Bernard Stamm and Jean Le Cam are forecast to finish some time between 1000 and midday on Wednesday, but still have some complicated final transitions standing between them and a well earned victory, which may make that ETA ambitious. Neutrogena and GAES Centros Auditivos remain upwind in the northeasterly trade winds, WSW of the Canary Islands, while One Planet One Ocean & Pharmaton is emerging from the Doldrums with We Are Water. Renault Captur is putting two days of frustrating upwind, lights airs sailing behind them and hoping the road to the Doldrums and the northern hemisphere opens for them just as the forecasts seem to promise. And Spirit of Hungary's Nandor Fa remains in 'solo' mode - while co-skipper Conrad Colman recovers from a shoulder dislocation. Cheminées Poujoulat has a date with destiny set. All things being equal the long time race leaders should complete the final 350 miles to the line with no major problems. Her lead is just under 1,200 miles over the second placed Neutrogena. 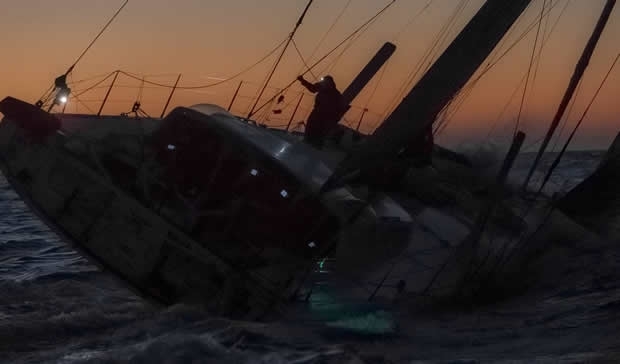 They may have been granted a relatively quick passage of the Doldrums, but the final miles to Barcelona on Wednesday might extract a payback as the last morning might resemble Doldrums-like conditions. Forecasts today put the Catalan city in an area of very light winds on Wednesday making the actual ETA quite difficult to to judge. Stamm and Le Cam are expected to run out of breeze this evening as a transition zone between the northeasterly Tramontana and the southwesterly in the south Mediterranean creates a zone of very light airs. According to the weather models, unfortunately for the Cheminées Poujoulat crew this area of light/no breeze seems set to follow them north to the Balearics. They should be just west of Ibiza tomorrow afternoon before they get into a more defined northeasterly. Strangely, the weather picture resembles start day, with the strong northeasterly blowing offshore well to the east of Barcelona, and northwesterly to the west and in between: not very much. In second place, Neutrogena looks set to gain more miles on GAES Centros Auditivos. At present Guillermo Altadill and José Munoz are on a course which will take them just north of the Canary Islands tonight and tomorrow. But Anna Corbella and Gérard Marín do not seem to be able to make as much height, and so will have to route south of the island group, or through them. Anna Corbella explainde: "The weather situation is not offering a chance to try a strategic play to get closer to Neutrogena. This is now the worst part for us. At this heading the speed differences are non existent and even if we took any risk at all we would not catch up miles, we need to wait and see what the Mediterranean. We will wait patiently for our moment." The battle to get into the northeasterly trade winds first seems to have ended with an even outcome between One Planet, One Ocean & Pharmaton and We Are Water. Over 12 0 miles to the east the advantage is certainly with Aleix Gelabert and Didac Costa. But in theory the upwind speed and height advantage - which is already evident - should be with the Garcia brothers, Bruno and Willy. They should be able to close down the 90 miles differential - which is also slightly skewed as Gelabert and Costa are closer to the rhumb line course which is very much to their east right now. Jorg Riechers and Seb Audigane on Renault Captur have endured two or three mind-numbingly dull days of light upwind sailing, but the they are convinced they have at last found the easterly trade winds. Their decision now is how to best get across the Doldrums which they should encounter in two and a half to three days, having been painted into a corner, forced close to the Brazilian coast by the weather patterns. Audigane reported: "It was the weather conditions that brought us here. We’re not really that close, as the coast is 85-90 miles or so away. A little bit more now. We were forced to sail there. Last week, a low pressure area made things rather complicated for us. We sailed where the wind took us. Let’s put it like that. Now we’ve been tacking upwind for two days, which is really annoying. "Today, the wind should come around on the edge of the high. We changed tack this morning, and in theory, the wind should continue to come around. We will be able to make our way towards the Doldrums, which we’ll probably pass through quite some way out to the west. That should make things easier for us, but it doesn’t mean that we’ll catch the others (We Are Water and One Planet, One Ocean & Pharmaton), as they are some way ahead and have been so for quite some time. Each time we were forced to tack, they just kept on sailing straight ahead. They were a bit slowed down in the Doldrums, but for the time being, it would be wrong to imagine some sort of magic comeback for Renault Captur. "We feel bad about having to stop, but we had no choice with the broken rudder, but that changed things for us and it’s not as interesting. After turning back from New Zealand, we had to round two low-pressure areas in the south, while they just kept going str aight ahead. At the Horn, we were slowed down too, even if we got around it… So, as you can see, each time we were forced to tack, that added extra distance, while the boats ahead of us were quicker on a more direct route. We weren’t really helped by the weather patterns. We’re looking forward to getting away from this upwind tack to get to Barcelona quickly…"